1. At the time of the Reformation, the Church ruled all. 2. One verse helped shape the Reformation. 3. His motivation was spiritual, but the outcome was political -- which reverberated worldwide. 1. The Bible is God's Word communicated to humankind so that they may know and love their Creator. It offers wisdom, hope and guidance for all areas of life.
. . . the Bible is both fully human and fully divine. So all its manifested contents – histories, prophecies, poems, songs, wisdom writings, sermons, statistics, letters, and whatever else, should be received as God’s authoritative instruction. As such, only the Lord Jesus Christ is the only mediator between God and man. (1 Tim. 2:5) No one need pray to, or pay for, prayer or access to God through a priest or anyone else. Likewise, the only sacraments believers should follow are those instituted by Jesus himself: water baptism (Matt. 28: 19-20) and the Lord’s Supper (1 Cor. 11:23-26). 5. "Sola Fide" and "Sola Gratia" are about faith and grace. Righteousness could not be bought, as the Roman Catholic Church advocated on the streets through the sale of indulgences and a piece of paper stamped by the Pope. Instead, after studying the book of Romans, Luther affirmed that he (and no one) could ever attain “the righteousness of God.” It was only by God's mercy; only through faith in Jesus and his imputed righteousness that anyone could be saved. Salvation was already purchased by the blood of Jesus on the Cross. There I began to understand that the righteousness of God is that by which the righteous lives by a gift of God, namely by faith. And this is the meaning: The righteousness of God is revealed by the gospel, namely the passive righteousness with which the merciful God justifies us by faith. ... Here I felt that I was altogether born again and had entered paradise itself through open gates. Justification through faith alone in Jesus, and through God's grace alone, not through baptism or penance or purchasing indulgences or Hail Mary's, but through Jesus alone, could anyone be saved. Thus, the first two Solas, Sola fide (Faith alone) and Sola gratia (Grace alone)-- became the foundational principle for the identity of believers even today who now have to clarify their faith with the qualifying adjectives: "conservative, evangelical, born again, Bible-believing Protestant followers of Jesus Christ." 6. "Sola Christus" means that saving faith in Christ is enough. Following Sola Scriptura, Sola Fide, and Sola Gratia, Martin Luther clarified the ultimate distinction between Protestantism and every other belief: salvation was possible through Christ alone: Sola Christus. Truth comes from scripture alone. Faith comes from Christ alone. At the heart of the matter lies the answer to the question: is saving faith in Jesus Christ enough? Or does one need to contribute something to atone for one's sins-- in addition to Christ's death on the Cross and resurrection from the grave? Martin Luther's reformation reduced these to two: baptism and communion. His reasoning was based on the centrality of the person and work of Jesus Christ as taught in the Bible. 7. Martin Luther argued for "the theology of the cross." Martin Luther argued that Christian theology was "the theology of the Cross." This meant that salvation from eternal death and separation from God was achieved only through faith alone (sola fide), grace alone (sola gratia), and Christa alone, Solus Christus. If you have true faith that Christ is your Savior, then at once you have a gracious God, for faith leads you in and opens up God’s heart and will, that you should see pure grace and overflowing love. The last of Martin Luther's Five Solas, Soli Deo Gloria, puts into perspective the purpose of life for all Christians: to glorify and enjoy God forever. One's vocation, or calling and purpose, is to glorify God-- no matter their ethnic, religious, cultural, or socio-economic background. No distinctions exist within Christianity; no one Christian is above another. This was another revolutionary concept Luther introduced-- and mind-blowing-- coming from an ordained priest and monk-- who rallied against one of the Roman Catholic Church's sacraments, the Holy Orders (becoming a bishop, priest, or deacon). 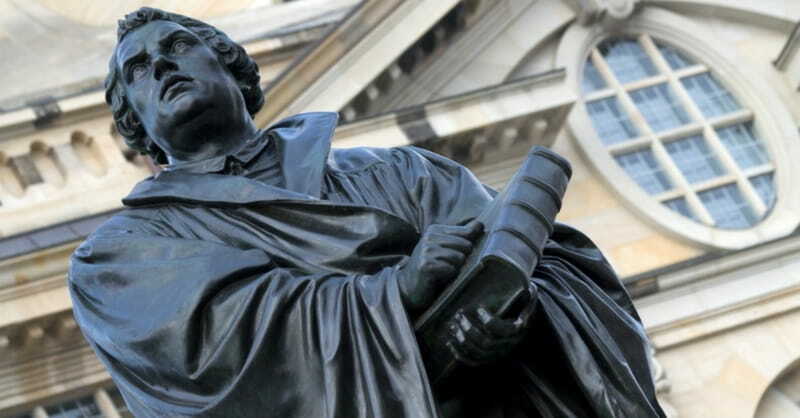 Luther renounced his ordination and later married, arguing there was nothing biblical about the Holy Orders or a requirement of celibacy for ordination. Neither bishops nor priests had the power to grant absolution, grace, or anything else. Nor could "the clergy" receive more grace or special favor from God than "the laity." The divisive and non-biblical Roman Catholic doctrine that had categorized everyone other than bishops and priests as "less than" for centuries-- was now declared null and void. One's highest calling, Luther clarified, wasn't to the church, but to God. God is a butler who sets forth a feast for the sparrows and spends on them annually more than the total revenue of the king of France. Christ worked as a carpenter. ‘I can just imagine,’ said Luther from the pulpit, ‘the people of Nazareth at the judgment day. They will come up to the Master and say, ‘Lord, didn’t you build my house? How did you come to this honor?’ The Virgin Mary worked, and the most amazing example of her humility is that after she had received the astonishing news that she was to be the mother of the Redeemer, she did not vaunt herself but went back and milked the cows, scoured the kettles, and swept the house like any other housemaid. Peter worked as a fisherman and was proud of his skill, though not too proud to take a suggestion from the Master when he told him to cast on the other side. No matter one's job, whether it be cleaning, care-taking, teaching, participating in athletic or music competitions, solving mathematic equations or building architectural feats, Christians do so primarily to glorify God. Christians can rejoice and give God the glory, no matter their vocation or circumstance-- and no matter the outcome. 9. You can have immediate access to God, personally serve God, and intercede for others. a German musician would subscribe to this teaching of Luther. So Johann Sebastian Bach would sign his pieces, both pieces commissioned for the church and his so-called secular works, JSB and SDG. JSB stands, of course, for his initials; SDG stands for Soli Deo Gloria. Luther and Bach, both significant figures from the pages of history, remind us that in our seemingly ordinary work and life we are doing something extraordinary. No Holy Order is necessary to serve God. And, with the emphasis on this sola, Luther reoriented the concept of the church to the definition of scripture. The body of believers wasn't defined by what one could get from the church (absolution, forgiveness, mediation), but what one could give to fellow believers. Soli Deo Gloria reemphasized that the importance of one's time, talent, and treasure-- was how it glorified God. 10. The legacy of singing in church traces back to Luther. Martin Luther's Five Solas solidified the doctrine of the Protestant Reformation: individuals had free access to God. Faith alone, grace alone, salvation alone through Christ was all possible once people understood that the basis for all truth is found in scripture alone. The Bible, not the state religion, provides the foundation for all knowledge. People no longer were enslaved to false promises and salvation through taxation. Rather, they could enjoy fellowship with other believers, and have freedom. Freedom to read, learn, and think for themselves. Freedom to work and love without the regulations and restraints enforced by the Roman Catholic Church. In 1529 German princes officially “protested” against Rome, thus becoming called Protestants. Their acts following Luther's initial protest is what Protestants worldwide celebrate and remember 500 years later on this Sunday, called Reformation Sunday. The outworking of Luther's transformation of the church was the emphasis of corporate worship. This meant that one could read-- and sing-- in one's own language. The days of not being able to understand Latin or have access to knowledge were over. Martin Luther revolutionized praise and worship by teaching Christians how to read and sing. Next to the Word of God, the noble art of music is the greatest treasure in the world. ... music deserves the highest praise. The gift of language combined with the gift of song was given to man that he should proclaim the Word of God through Music. Music is a gift and grace of God, not an invention of men. Thus it drives out the devil and makes people cheerful. Then one forgets all wrath, impurity, and other devices. Next to theology I give music the highest place of honor. As long as we live there is never enough singing. Luther wrote five Christmas carols, initially for his children. He wrote From Heaven on High for his five-year-old son Hans, which was published a few years later. As part of his family's Christmas Eve devotions, the children sang in response to a man dressed as an angel. His hymns and carols are a testament to his creative celebration of music. Stanzas 1-3 of the original text were inspired by Psalm 46; stanza 4 arose directly from Luther's persecution experience. The text expresses trust in God's protection amidst the battle that Christians wage against the devil. "Earthly powers" in stanza four undoubtedly referred to the Roman Catholic authorities of Luther's day, but modern Christians may identity other "powers" that oppose the rule of Christ. The closing line of the text provides much comfort: "God's truth abideth still; his kingdom is forever!" Imagine no choirs, no carols, no singing in church. No praise and worship bands. No reading hymnals. Martin Luther, and the Protestant Reformation made this possible. The legacy of singing in church is directly credited to Luther and his counterpart reformers in other European countries. Slideshow based on a series of articles by Bethany Blankley. Used with permission. Bethany Blankley is a former Capitol Hill staffer, Fox News Radio political analyst, public speaker and commentator on Christianity and politics in America. Her commentary can be read in The Washington Times (Axis Mundi), Townhall, Religion Today, Patheos (Hedgerow), Charisma News, Christian Headlines, Beliefnet, among others. Her book, What Every Christian Needs To Know About Islam, is forthcoming. Follow her @bethanyblankley, www.facebook.com/BlankleyBethany and BethanyBlankley.com.